CryptoSoft is an automated trading software scam that opened in September 2017. The CryptoSoft trading robot is no different than many other systems that we already reviewed. If you are just now starting your search for a legit automated trading software, then you should check out the popular trading systems, look here. You Will Lose Money Using this Software, see why. Instead, Get an Account with a Licensed Broker. This automated trading robot that is behind this software, is a classic trading scam. It is called in the industry a “random signal generator”, since the only thing that you the investor can control is how much many trades the software executes on your behalf. Worse than that is you really have no idea what the software will do. 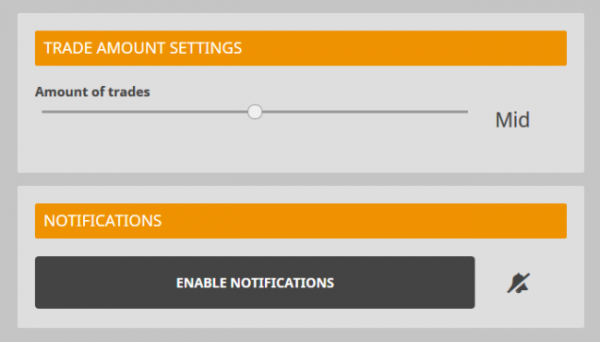 The only setting you can adjust is “Amount of Trades”. What does that mean, 5 or 500 trades a day? Currently available are hundreds of Crypto Trading Software just like this one. But if you compare it with a real trading software, you will see that they offer investors the ability to control many aspects of the software. When the team at Scam Broker reviewed the CryptoSoft software, we dug deep to see if they are making any false promises or misleading statements. 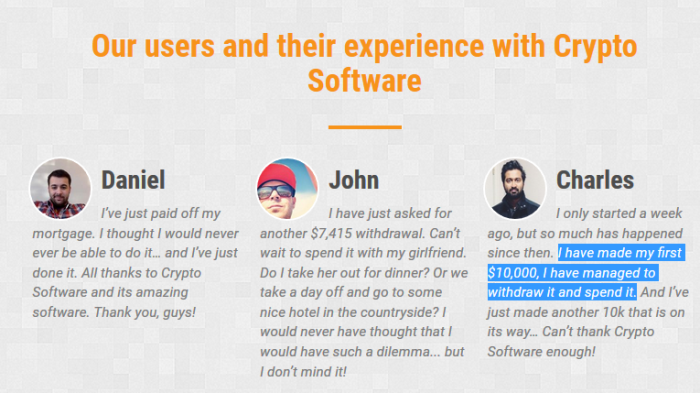 We don’t believe any of these testimonials they published on their website, especially since they also told us to invest with an unrelated binary options broker. A software like CryptoSoft works exclusively with offshore brokers, and if you invest with an offshore broker you will only have problems. Please tell other readers which scam broker The Crypto Software told you to use, in the comments section below. You can see in complete details how the Crypto trading software scam works by reading this. The first thing that every investor must know if that there are 2 types of brokers, licensed and unlicensed. Take a look at the legal Forex brokers people use, look here.